I wish I lived in the united kingdom so I could send my pups their to stay. Welcome to Sausage Dog Hotel, the premier choice for those difficult times when your beloved sausage needs a home away from home. We provide a full range of services, including long and short term stays, regular day care, walking and much more, all specifically tailored to dachshunds. Located in Hertfordshire, just south of St Albans, with extensive countryside and woodland right on our doorstep, we are also within easy reach of North London and service a large part of the surrounding area. We are fully licenced by the local authorities, and have insurance policies to cover all our activities – at home, while traveling, and when out walking. We also offer a pick up & drop off service for those sausages that live further afield and want to come stay with us, and have regular guests from all over the country. How can they be so happy to play in the cold then act like it’s freezing when it’s 95 in the shade? 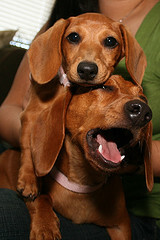 Rommel, the very first dachshund I got, is a classic red. He just celebrated his 10th birthday with us in September. Rommel really loves to play “ball” as we call it (though most refer to it as “fetch”), he loves it so much that he will keep playing until he passes out, with the ball still in his mouth, of course! When I sit at my desk, he is always on my lap, happily spending time with me. At night, he loves to cuddle up and sleep under my left arm. Curiously, unlike all of my other dachshunds, Rommel prefers to keep himself separated from other dogs and enjoys spending time on his own. Franzi, my second dachshund, is eight years old and chocolate and tan in coloring. She’s actually my husband’s favorite dog, though he likes to claim otherwise. Too bad he gives himself away with the way he cuddles with and talks to her! I knew Franzi would be a perfect fit for me and my family when I first laid eyes on her. At the time, I saw her, she was destroying what little remnants there already were of an empty Crunch Bar wrapper. Franzi loves to eat and I mean it! She’s always weaving between my feet in the kitchen, eagerly waiting for me to accidentally drop something so she can snap it up before it’s even hit the ground! Just when I think I’ve got the house spotless, she also always finds whatever tiny scraps of food have managed to elude me hanging around. She’s also a huge fan of digging holes. Actually, I think trenches and burrows would be better ways of describing what she digs. They’re gigantic! Sometimes, I’ll see her newest crater in our yard and try to figure out where all that dirt when; it just seems to vanish! Her favorite spot to sleep at night is directly under my pillow, snoring the whole time too, for added good measure, I suppose. 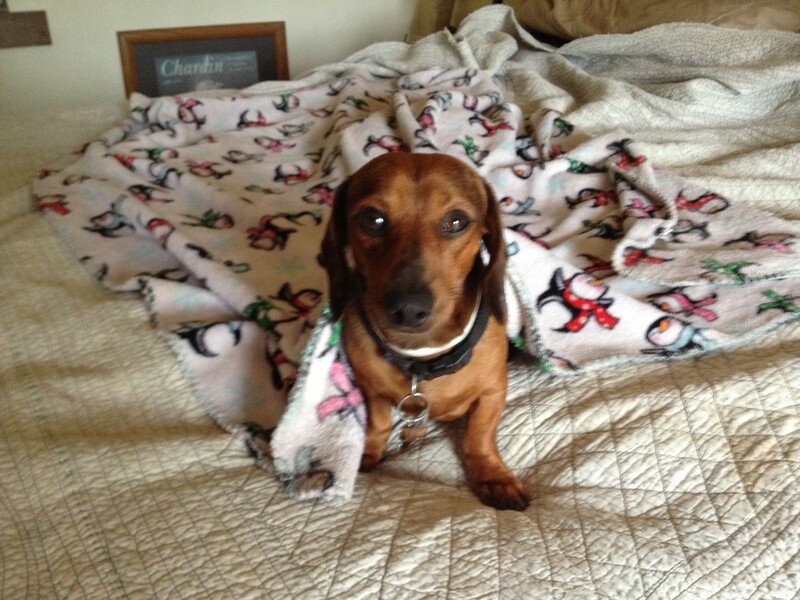 Montgomery is my third Dachshund and he is 6 years old. He’s a brownish-red piebald. Unfortunately, he’s blind in one eye and one ear, but that certainly doesn’t stop him! I rescued him and have never regretted it! He’s quite the character! He also loves to dig and eat like Franzi, though he’s usually assisting her rather than working on his own projects. His bark is so loud and shrill that it hurts most people’s ears and he certainly loves to bark! Monkey, as we call him, is very sweet and seems to think he’s still a puppy. He loves to run with the pack or and get into anything else the other dachshunds are doing. He’s best friends with one of other other dogs, a German Shepard named Noet. Lastly, but certainly not least, there is Hank. Who is also known as Alex, Little Man, Squeak Box, or Buddy. Everyone in the household and those who come to visit seem to have their own name for him. He is a red dapple in coloring. He’s a very happy dog in nature, but scared and skittish of most people. Hank was also a rescue with a more difficult past. Whenever my son comes out of his room, Hank has to bark at him with a peculiar squeak of a bark. Then he immediately runs a way from him! (Or any men at the house really.) When we got Hank he was an all skin and bones puppy. Hank was hit by a car and taken to the pound. That’s where we found him. He has since grown and pumped up. Though, he still thinks he is starving to death, which we don’t entirely blame him for feeling that way. You can’t open the fridge with out him! I’m lucky I get to spend all day with my pack. We have a great time together. They love when I make them home made dog food and peanut butter treats because they get to help, but more than that, they love when I give them to them to eat! I certainly hope you enjoy your Dachshunds as much as I do! Maybe you can tell me a little about yours? So, let me tell you a little bit about our new friend that has joined us. His name is Alexander, who originally came from off the streets, into the shelter and then, into my home. He arrived at the shelter by someone who thought he was a possum and ran him over. That is when he realized that he wasn’t a possum but a dachshund! But don’t worry, he was curled in a ball in the road and so had just went under the carriage of the car. The driver then stopped picked him up and took him to the shelter, where is where I work. I watched and waited as potential adopters came in and one after another had looked at him for he cute and quite disposition. Though, since he was really quite, he was quiet scared and so one after another people left without taking him. After two weeks of him being there, I finally adopted him and took him home with me where he made friends with the other dachshunds. After first, he was really quite, and avoiding some of the dogs. Now he barks and thinks he is a fierce land shark. 🙂 Alexander, surviving being ran over three time, being in a shelter for a couple weeks and coming into a new home with other dogs he didn’t know. That is his story.